I'm getting this error message which in turns closes my pages and I have to start all over. Don't know why its happening, just happens out of the blue. also, my laptop is not very old but it runs SOOOOO SLLLOOOWW! Internet Explorer raised unhandled exception in third party module and should be closed. We are sorry for inconvenience. Re: Getting crazy error message!! Driving me crazy....HELP! It looks like Adobe Acrobat Reader gives you some issues. I suggest, you unistall Adobe Acrobat Reader, which is a resource hog, and install FoxIt Reader: http://www.filehippo.com/download_foxit/, which is much smaller, and faster. It does very same thing. 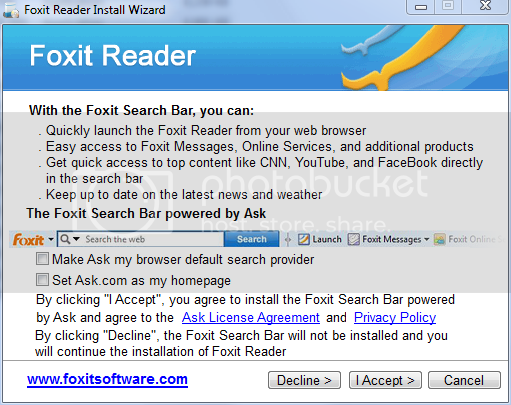 Note: When installing FoxitReader, make sure to UN-check any pre-checked toolbar, or other garbage. Thanks so much for your suggestion about Foxit. I got rid of adobe and installed Foxit. Was very easy to uninstall and install. THANKS!